Product Description: Kama Ayurveda Bringadi Hair Treatment oil is meant to prevent hair loss, dandruff and premature graying. It is also a natural conditioner for lush hair growth. In addition, it cools the head.Intensive Hair Treatment, the secret of Indians' lush, glossy hair, is a blend of herbs processed in pure sesame oil and milk. The herbal formula includes indigo (neeli), Eclipta Alba and gooseberry to promote hair growth; liquorices which acts as an anti-fungal agent; and balloon vine which prevents scalp infection. Kama Ayuraveda Bringadi oil comes in a transparent plastic bottle with gold coloured vintage type cap. The oil is dark brown in colour and has a strong herbal fragrance which could irritate sensitive nose. Some of the herbs used in this oil are Liquorice, Indigo, gooseberry, Bhringraj, Ballon vine (muadakathan keerai), coconut extracts, lavender and rosemary essential oil. Bringadi is made out of sesame oil which has the property to cool down the body instantly, for that reason it is advice to use the oil 30 minutes before washing the hair. If you have sinusitis problem I advice you to leave this oil in the hair for 15 minutes and not more than that. The oil not very sticky or greasy. Kama hair oil has reduced my hair fall and the pesky dandruff problem to an extent. It leaves my hair soft and smooth after hair wash. One bottle will be sufficient for 2-3 months, if you are a person who applies oil twice a week. It also claims to work on premature greying, as I don't have any I can not comment on that. 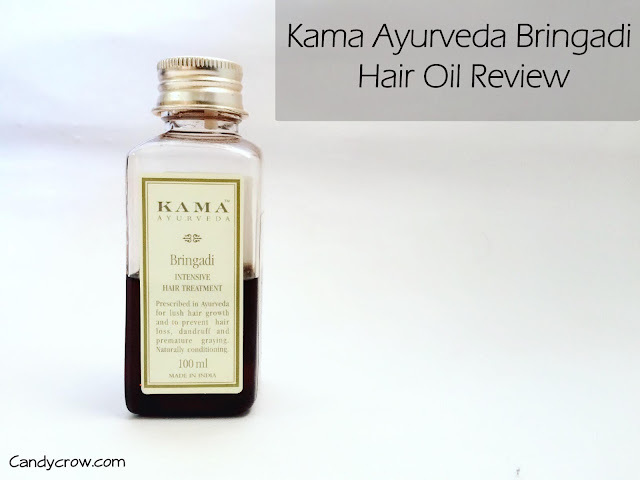 Kama Ayurveda Bringadi Hair oil is true to it's claims; it reduces hair fall, act against dandruff as well as scalp infection. If you are a fan of natural products, do give it a try.